In school, I was told that if I had time, I should check my work. This was emphasized in mathematics and in the sciences. In writing, there usually wasn’t time. Writing the first (only) draft took up most of the time alloted. As a result, I never got into the habit of editing my work. I know from experience that editing is critical to good writing. I’ve been on both sides of this: as a writer and as a technical editor. However, when it comes to my writing, especially when not for formal publication, I typically don’t edit my work. My immediate writing will be better as I catch grammatical mistakes and improve clarity. My long term writing will be better because I’ll be in the practice of improving my writing. The first benefit is obvious. However, if you’ve never had an editor, that second benefit is harder to believe. I can only speak from my own experience. I’ve seen my writing improve due to editors pouring over my work. As they have pointed out the mistakes and weaknesses, I’ve had to correct my writing; I’ve learned from that exercise. I think back to my first attempt at writing for publication and I realize how poor a writer I was. Everything I turned in needed heavy edits. My writing today needs fewer edits but it still needs editing, though. If you want to improve your writing, edit your own work. If you can, find a competent editor and have that person edit your work, too. Take those edits and improve your writing. Then edit and improve your work again. Keep at it until you have to release it. Over time you’ll notice the improvement. Hopefully it’ll spur you on to keep at it as writing is most like any other art or craft: we can always be better at it. Have you ever given an explanation and the person receiving it didn’t seem to understand what you’re saying? A lot of us have. How do you overcome that situation? Let’s work this through. Realize that you are the one to fix the situation. One of the most valuable things I remember from US Air Force ROTC was that the person communicating the message was the one responsible for making sure it came across clearly. This assumes the listener/receiver wants to understand the message. However, if the message is unclear to the listener, there’s little the listener can do about it. The listener can ask questions to try and understand, but ultimately clarity must come from the one giving the message. Therefore, if you’re the one giving the explanation, it’s up to you to ensure the message comes across clearly. It’s not the listener’s fault if it doesn’t and the listener is earnestly trying to understand. You must make things plain. Understand what you are explaining. First, we must ensure we understand the explanation. I’ve been in the situation where I began to explain something and then realized I didn’t fully understand what it was I was explaining. Likely you’ve been there, too. Before beginning to explain something, ensure you understand it. Second, we need to consider the audience. If I’m dealing with another IT security professional, there is jargon that I’ll use that is common in that career field. These special words often convey ideas that we understand the meaning of. For instance, when I say, “DDoS,” another security professional should know exactly what that means. When I’m talking to my daughter who is in elementary school, simply saying that will be meaningless. Likewise, if I am talking to a fellow security professional about the Mane character in the My Little Pony card game, I probably will have to explain what My Little Pony is, what the concept behind the game is, etc. When it comes to my daughter, no such explanation is required. We can start right into why she has chosen the Mane character she has in her deck. Therefore, keep the explanation as simple as possible. Also, keep it as short as possible. Explain the root issue and what caused it. If you’re audience wants further explanation, you will be asked for it. One final point: if you’re the type who likes to be wordy (guilty as charged), remember that writing an essay when a paragraph will do will cause some folks to not read your explanation. If you’re giving it verbally, they’ll tune it out. And you’ve just defeated your whole purpose. Blogging is writing. While blogging may be shorter than an essay and certainly shorter than a book, it is still writing. You are still putting words together to communicate an idea. Typically this is done in prose, not poetry. Therefore, blogging is writing. Why does this matter? The key ways to improving your blogging are therefore already known. They are the methods and exercises and techniques to improve writing. Note I didn’t say improve your readership numbers or how well you show up on a search engine. I’m talking about the craft of generating better blog posts. Or should I say writing better blog posts? While other factors like interesting pictures can help convey an idea, you still have to say it with words. 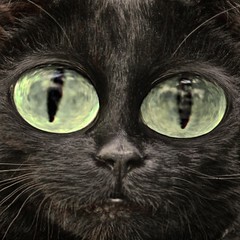 An interesting image isn’t enough, even if it’s sort of eerie like the cat eyes I’ve selected for this post. Interesting images may attract someone initially, but they won’t keep a reader. Good writing has a far better chance of that. And remember the writer’s mindset: never be satisfied with your writing. Always look to improve it. Especially what you’ve already written. This isn’t my original thought. I’ve seen it repeated over and over again by great writers whom I admire. I think this is what sets them apart. They aren’t ever satisfied with what they’ve written. They are constantly reviewing what they’ve produced in the past and looking to improve upon it. This, by the way, makes a good developer, too. A good developer, upon revisiting some of his/her old code after some time away, should think, “I actually wrote this? This is poorly done. I know how to improve upon it.” This should be true if you if you want to write better, if you want to blog better. Remember, blogging at its core is writing. Improve the core. Improve the writing. I remember in the mid 2000s when I wanted to do enough to be recognized as a Microsoft Most Valuable Professional (MVP) in Microsoft SQL Server. At that time I saw it as the “next level.” Folks I really respected were being named MVPs, folks I wanted to follow in the footsteps of, so naturally, I hoped one day to be an MVP as well. At the time, though, I didn’t hold out much hope. My job as an infrastructure and security architect meant I had very little time for outside work, even writing a few articles here and there. I wasn’t working with SQL Server day in and day out. And while I was knee deep in Active Directory, I never felt like I had a familiarity enough with the community to dive in. Then, in 2007-2008 I decided I really wanted to focus on SQL Server. I paid out of pocket for some opportunities to speak, reached out to friends in the community for opportunities to write more and do some training videos and commit to what I love to do: sharing about SQL Server and especially about security related to SQL Server. A friend thought I had done enough to warrant a look, nominated me for MVP, and in January 2009 I was awarded the recognition. And that’s when my journey really started. Started? Yes, absolutely. Sebastian Marshall (blog | twitter) has a post about how he took himself off the list for those his age as far as what they had accomplished. He was in the top 1%. Instead, he put his name on the list of the greatest men of all time. That meant he was now at the very bottom. It is hard to think high and mighty of yourself when you are comparing yourself to Thomas Jefferson and Tokugawa Ieyasu. When I was awarded an MVP, I looked up and saw a bunch of luminaries whose work I’ve followed for years. While I was receiving the same award as they had, I was at the bottom of a new list. I won’t pretend I was at the top 1% of some previous list. Sebastian had something quantifiable to use as a measuring stick. How do you measure knowledge in SQL Server? I don’t know. I just know that there are a lot of folks who are MVPs who dwarf my knowledge. Folks I still want to be like. Folks who I still look up to. So while I may be a SQL Server MVP, I still consider myself near the bottom of the list. One of the weakest names. Who do I place below me? No one in particular. I just hope I’ve made some progress on the list these last 3 years. It really doesn’t matter, because the past is past. There is still a long road ahead. I still have a lot to do and a lot to learn to be anywhere near where I want to be. This is what becoming an MVP meant to me: moving to the bottom of the list of some really awesome SQL Server people with the goal to work my way up by knowledge and experience. Part 1 – Defining Resistance, which is what wars against art and creativity. Part 2 – Tactics and strategy for fighting Resistance. Part 3 – a miss-mash of spiritual talk and literature and Jungian psychology and I’m not sure what else. Part 1 is good. Part 2 is okay. Part 3, by my description, I’m pretty sure you’ve figured out I’m saying not to bother with. Notice I didn’t say great, so I’m not sure why it got 5 star reviews. Everyone has their own opinion, so here’s mine, for what its worth. Pressfield tries to define that which keeps us from completing the creating projects we start. While focusing primarily on writing, Pressfield makes it clear that Resistance opposes any creative effort. So what is Resistance? Resistance is sort of a personification of those bad habits and self-destructive behaviors that prevent us from getting things done. Part 1 reviews them, considers why we have them, and talks about why they succeed. Now, I said part 1 is good. It’s good because it’s a welcome reminder of these behaviors. However, Pressfield isn’t coming from the position of any research, but rather his own empirical evidence. And the problem with empirical evidence like this is it consists of a test body of 1. Part 1 is good to read to provoke thought. Part 1 is good for one to look at and ask, “Are these true of me? Am I my own worst enemy and, if so, how specifically?” That leads to Part 2. And that leads to Part 3. I should have been prepared for it when I read the Foreword and the writer noted he disagreed with Pressfield. Part 3 is supposed to be where you get your inspiration. Pressfield points to a higher plane, a non-physical one, and mixes a lot together for his view. He cites his own habit of reciting a prayer to the muse (and meaning it) before he sits down to work. Then he talks about angels, about Hindu sacred writings, about Greek gods and Native American characterizations of the same. He brings in some Jungian psychology and even stirs things up a little with the Bible. I’m not sure how much value there is to this last part. It might inspire some, but the simple act of getting out there and writing and doing whatever it is you find that fulfills you creatively. Would I recommend this book? I don’t think so. It’s a short book by number of pages and that doesn’t really tell the true story. Many of the chapters are short and I can say that on the Kindle version there was a lot of white space so I’m assuming that in print the chapters look minimal, too. The only section I got much value of was part 1 and part 3 I felt was just not worth reading. I did so, to the end, to see if there was a hidden nugget of wisdom there, but left finding nothing worth the time spent. If you can get it through your library or by borrowing it from a friend, then Part 1 is worth the read, and possibly Part 2. However, there are quite a few folks that absolutely love this book, so perhaps I’m missing something. Where did that DBA go? During the summer months, junior high schoolers aren’t in school, so my ministry commitments step up. Plus, lately there are some areas I feel like I’m called to get rolling, and that has added to the amount of time I’ve spent on the ministry side. Given that, something had to give, and it was some of the attention and time I put towards the IT pro side. This is part of the normal ebb and flow of priorities in my life. As I hopefully start establishing these new ministry pushes, I expect to be still kind of quiet on the IT pro side. Things will probably start to shift back over towards October, with the PASS Summit in Seattle, WA. Even that won’t be completely IT pro, though, as I’m staying with a former ministry partner who now works for Microsoft. He and his wife have offered me the spare bedroom of their house for the week I’ll be there and that saves money and allows me to be able to catch up with two wonderful people who have been blessings in my life. I’m really looking forward to that. Notice I didn’t say I was taking time away my family. I finally understood that hard lesson a few years ago when I sat down and realized that every day with my wife and my children is precious. I was looking at my oldest son, then ten, and realizing we had less than a decade left before he would be moving out on his own with college and then beginning his own life. That immediately spurred the question, “Where did those ten years go?” I still desire for more time with my wife and children, I think we all should, and I have made the conscious decision never to steal time away from them unless it absolutely can’t be helped. These would be emergency situations only. I have learned that trying to do the trade-off doesn’t work out so well and that you never get all the time back. Yes, I put an exception for those “sometimes it can’t be helped.” But when it can be, and most of the time it can be, I’ve got to stick by what I know are the right priorities, regardless of how gleaming an opportunity might seem. If you’re wrestling with these types of questions with respect to family, think about it long and hard until you come to a decision that gives you some peace. Then stick by that decision. So if you’re on the IT side and been wondering why I’ve not submitting to SQL Saturdays or doing user group presentations and my why article and blog writing has been down, it’s because the time has been allocated to ministry. I’ll be looking to get back involved at a higher clip in the fourth quarter of this year, slowly starting to pick up now with things accelerating even more in late August to where I’ll be back around “normal” in October. If you have more ideas, great! Save them for another speech (or blog post/article). Focus on the one idea you want to communicate to your audience. You want to ensure your audience gets your idea. And you want it to be as compelling as possible. If you’re writing on a technical topic, make sure what you’re trying to get across focuses on that single topic. This is a problem I’ve struggled with in the past. I want to communicate too many things. It’s hard enough to get one idea across. So just focus on getting that one idea to your audience. This should be obvious, but a lot of us miss this point. If you get up there and talk or if you write and there’s no clarity, then your idea doesn’t come across. That defeats the whole purpose of what you’re striving to do. So you need to make sure that you get the idea across clearly. In order to do that you must first be sure that you are clear on what that idea is. If it’s not clear to you, it’s not going to be clear to your audience. When communicating that idea, use clear, plain language. Hiding behind jargon runs counter to your purpose. We’ve all joked about “buzzword bingo” and that’s something you want to avoid. Dr. Richard Feynman was renowned not only for his expertise in physics, but also for his ability to take complex topics and explain them in a way ordinary people could understand. This is what is to be aimed for: the clear communication of the idea. Remember your audience and choose your words careful to reach them. It’s easy to just sit down and start writing. Grab a dictionary and write one word. Flip a few pages and write another word. Flip a few more and another. There, you’ve sat down and you’ve started writing, right? Not at all. All you’ve done is copy a few words out of the dictionary and they probably make no sense together. You want to make sure that as you communicate your idea, that you aren’t doing the same thing, only you are using phrases, sentences, and paragraphs. Make sure your idea is developed in an orderly way. Ensure the audience can follow along and that your building on your idea throughout. Tangents and “rabbit trails” should be avoided. One of the things I hate to see in writing is a sidebar that is only loosely related to the topic being covered. Yes, I’ve been guilty of doing this in my own writing and it makes me cringe when I see my own failings in print. Stay on topic, ensure it’s organized, and work to develop your idea logically. If you are working on an idea and not a topic like, “How do I change a flat tire,” then you want to make sure that as you present the idea, you give evidence supporting it. For instance, when I wrote an essay back in the 9th grade against the Intermediate-Range Nuclear Force (INF) Treaty, I did so having done an extensive amount of research. The INF arsenal gave us punch even in a sudden invasion of West Germany without having to launch ICBMs from US soil. It seemed really foolish to get rid of this defensive measure. So I spent the paper discussing force distribution in Europe, ranges and numbers of the weapon systems and the situations where we would employ them, and the lack of anything similar to provide equivalent capabilities. All of this went to support my position that we should not sign the INF treaty. You need to do the same sort of thing with your idea. As you develop it, you need to provide facts and reasons why your idea is sound. You need to give your audience reason to agree with your idea. Here you are looking for credible, verifiable sources. Now those facts and reasons don’t have to be as hard and fast as what I used in my position paper. They could be stories and anecdotes. One of the things Al Gore tried to use in his failed presidential campaign was anecdotal stories. Why was this one of his strategies? Stories people can identify with are seen as evidence for your idea. This strategy has worked in the past. And it works now. We typically love good stories. Now what you use is up to you. Make sure it fits the idea you’re trying to convey and the audience you’re trying to reach. If you’re trying to defend a graduate dissertation, stories won’t cut it. If you’re trying to talk to a bunch of children, detailed facts with pie charts and other business type notes won’t either. Remember that these need to be verifiable. One of the things that burned Gore was that as the media started to check into his stories, they were able to find and prove that at least some of them were either stretched greatly or flat-out made up. As a result, Gore’s strategy backfired, especially as Bush found ways to convey his ideas to his audience, the American people, better than his opponent. I remember my senior year at The Citadel I was given a presentation on research done by another physics major. I did the best that I could and it was a worthy topic that I understood, but I don’t feel that I did a very good job. Why not? Because it wasn’t research I was interested in. I agreed to give it because my fellow physics major had a conflict and couldn’t present the paper he had worked on. If you are interested and passionate about your idea, it will show. One of the things that characterizes the TED talks is that the speakers are very passionate about their ideas. That’s what makes most of the presentations compelling. If you aren’t interested in your idea, folks will begin to sense it. And then they will ask, “If he doesn’t care, why should I?” Then it doesn’t matter how good an idea is, you’ve lost them. Be interested in it and find a way to convey that interest. What about the idea appeals to you? What makes it special to you? Bring that out.